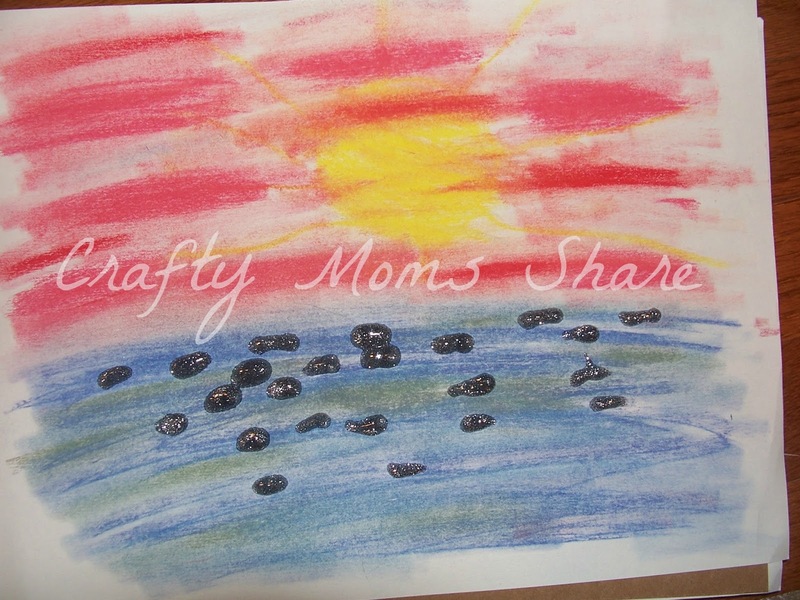 Thank you to all of you who shared with us last week and to those who came to be inspired by the amazing ideas shared! If you haven't had a chance to visit them, you should!! I know I am exciting to try out some of the activities. Now that the end of August is upon us, I have decided I cannot pretend summer is not ending anymore. Well the end of August and Hazel starts school this coming week. So, in honor of her school starting, I figured I would feature a few of my favorite back to school posts from last week (there were quite a few, but I just picked three to share with you). Here are a couple of my favorite non-school posts. Ok, Hazel would LOVE both of these!! 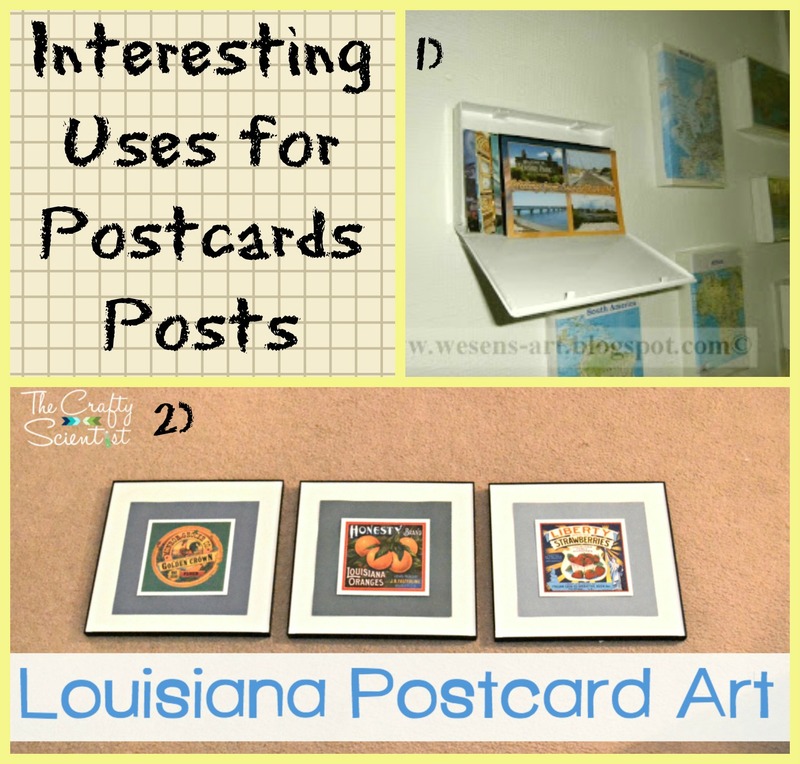 Then we had two posts about postcards. Since they were on an unusual topic, I figured I would share them with you! This week we shared some great DIY party crafts and reviewed Shindigz Party Supplies, shared our second Donald Crews book for Virtual Book Club for Kids, shared an Algerian Snow White, shared some great books for math lessons in nature, shared our homemade xylophone and shared a great story on friendship for Flamingo Friday. We have some exciting things coming up this week!! 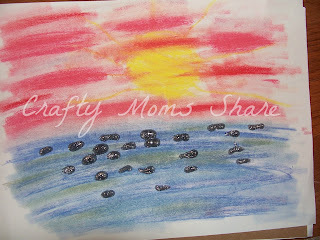 I cannot wait to share my post on Sunday with you, so I hope you will stop by tomorrow! We found a fun book at the library. In Nifty Thrifty Music Crafts by Felicia Lowenstein Niven has wonderful ideas to take recycled objects and make music. Many of the ideas are familiar, but some have new twists. Hazel cannot wait to make a ukulele, but we need to finish our box of cereal first. This book also has rhythm blocks, panpipes, finger cymbals, colonial drum, American Indian clapper, tambourine, rain stick, maracas and a ukulele. We are definitely going to try the ukulele at some point. I also like the rhythm blocks, but we will see. 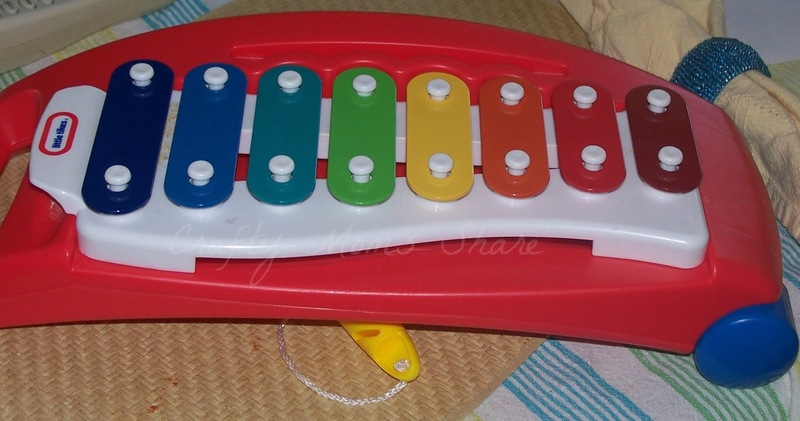 Anyway we started with the xylophone. 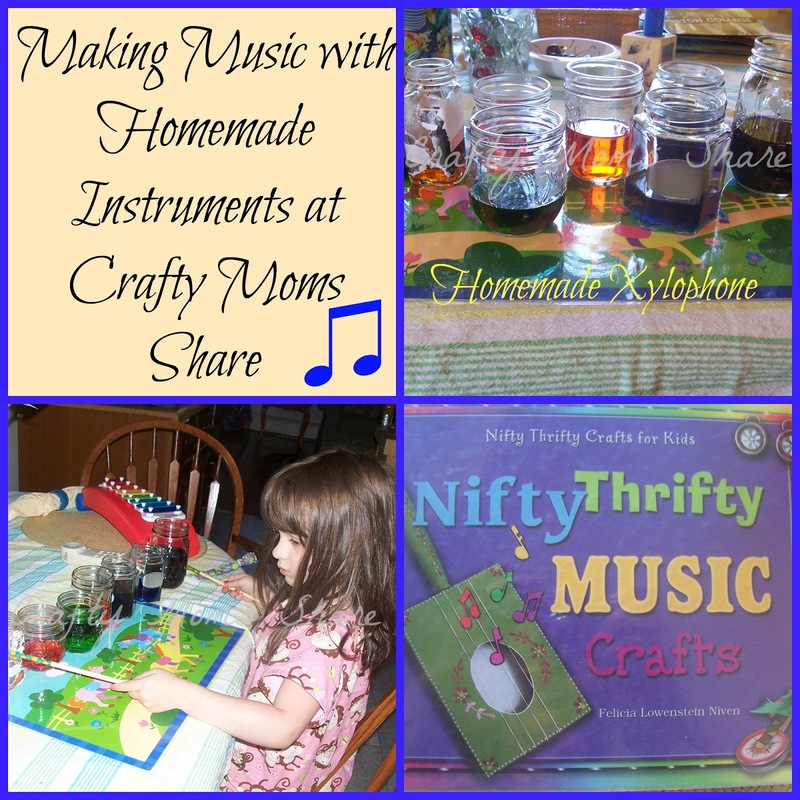 Now we have a xylophone, but making one is part of the fun of the homemade one. 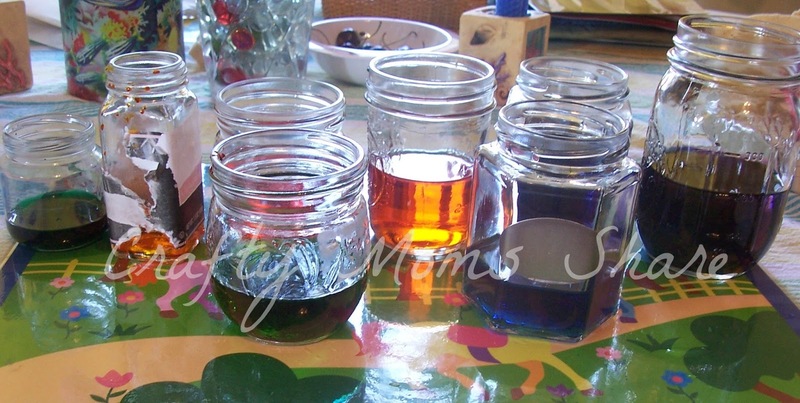 To make one you need empty jars, a wooden stick (chopstick, pencil or a stick) and water. You can also have food coloring--Hazel will tell you this is one of the best parts. 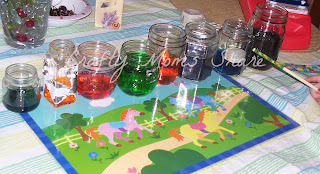 You fill the jars with different amounts of water and can add food coloring to each one. 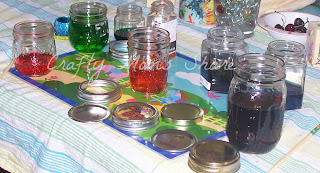 We made different colors in each one and tried mixing colors to practice what colors would make the secondary colors. 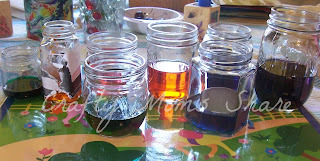 We used different jar sizes, but they could all be the same. Then you hit the jars with the stick to play it. Hazel had the best time experimenting. She tried hitting the sides where the water was, the sides where the water was not and the tops. Then she asked if we could put the lids on. Apparently I did not take a picture of this, but in this picture you can see the lids all around. 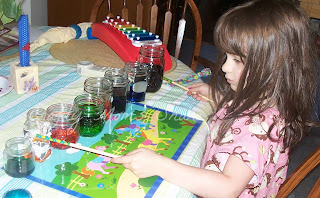 With the lids on she hit the sides and the lids to see if they made different sounds. 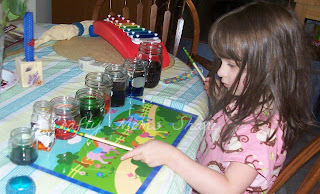 She had so much fun with this activity. She did not want to dump it out so she could play for Daddy. She also asked if we could do it again. My little musician is always happy making music. Needless to say, we will be doing this again. I think she liked the homemade one better than her store bought one. Today I am sharing some books to combine math with nature. Now as a math teacher I know the importance of seeing math everywhere. It allows the student to really see why mathematics was invented. People needed to understand the world around them and mathematics helped them do this. The first obvious lessons involve recognizing shapes all around. This is easy to do on an outdoor adventure/nature walk. Depending on the age of the student, have an appropriate list of shapes--both two- and three-dimensional ones. Make sure to introduce what each shape is ahead of time. The next obvious thing to do is to look for patterns. Several of the books I am sharing today will help with this as well. 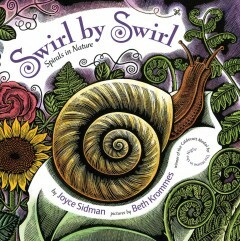 The first book, Swirl by Swirl Spirals in Nature by Joyce Sidman. This book does not really have math in it, but recognizes the beautiful spirals in nature. Combined with other lessons, it will fit in nicely. This book is nice because it shows animals sleeping in spiral shapes and not just the typical spirals one thinks of. The second book goes nicely with the first. 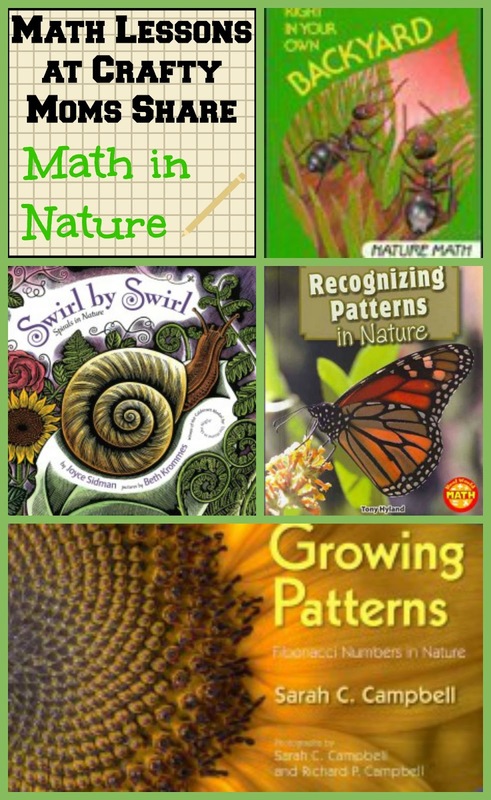 Growing Patterns Fibonacci Numbers in Nature by Sarah C. Campbell. This book is a lovely introduction to the Fibonacci Numbers: 1, 1, 2, 3, 5, 8, 13, ... The pattern to the Fibonacci Numbers is to add the two previous numbers to get the next one. The amazing thing about Fibonacci Numbers is how they seem to appear in nature over and over. Campbell uses photographs to show this in many situations. At the end of the book there is a short expansion page with information about Leonardo Fibonacci, the mathematician as well as other topics that often are discussed with these wonderful numbers including the golden ratio and the golden spiral. For older students it would be very easy to expand on these with minor research. 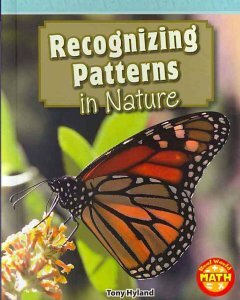 The third book, Recognizing Pattern in Nature by Tony Hyland, is about a class who visit a camp in the woods and their explorations with nature and patterns. It is actual activities and problems to do with them. It of course ends with an activity on Fibonacci. All three of these books tie in nicely together. This one is better for grade school children versus preschool, but can be altered for younger children. 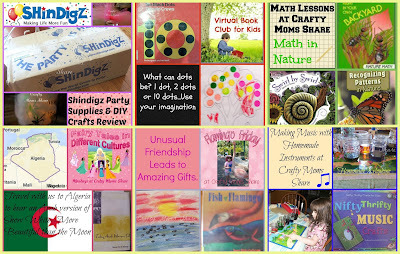 The final book is Right in Your Own Backyard: Nature Math published by Time Life for Children as part of the I Love Math series. This book is for older children (grades 1-4 I would guess), so we did not spend much time with it. It includes lessons on estimating large numbers, classifying, patterns, shapes and lines, charts and measurements, symmetry, deductive reasoning, time, and operations (addition, subtraction and multiplication). The book has beautiful photographs with each lesson and really brings the concepts down to the level of the child. There are also many ideas for activities on line. Here are a few I found. PBS Teacher Source has an array for grades 3-12. The Franklin Institute has a great pdf you can download. NALD.ca also has a great pdf to download. So that is our math lesson for this week!! I hope you will get your kids outside and learning some math and nature! We have a winner!! Congratulations to Doreen W. for winning the Room on the Broom DVD! Today I am going to share our second book for this month's author in the Virtual Book Club for Kids. This month's author is Donald Crews. Last week we shared Carousel. 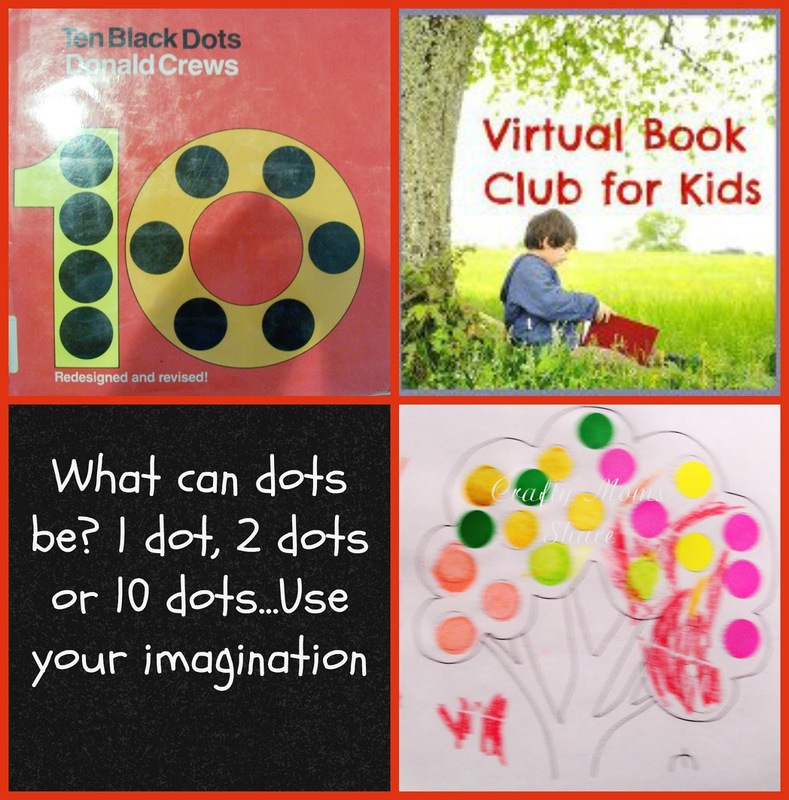 This week we are going to share Ten Black Dots. 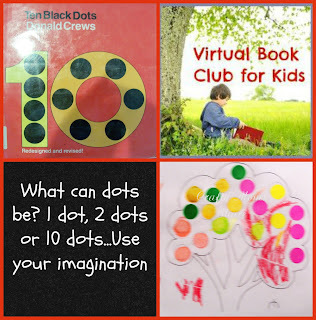 If you do not know anything about the Virtual Book Club for Kids, you can check out my post last week or click the button on the left which will take you to the Book Club's Facebook page. This book goes through what one black dot can make all the way up to what ten black dots can make. We discussed our own ideas. We thought one could be a smiley face. Two could be bicycle wheels. Three could make a Mickey Mouse (or Minnie Mouse as Hazel is sure to add). We stopped at three though. For one month this summer, the children's librarian at our public library read this book each week for the preschool story time. We only made it to two of them that month. We went to the first and second ones. At the first one she read the book in a normal fashion. 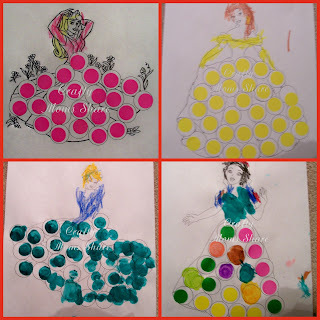 Then she gave the kids pictures to color with spots to fill in with dot stickers. We capitalized on this idea and did several of these. Actually this has been Hazel's independent activity each morning when she wakes up while I get to sleep a bit later. I gave her the letters of her name. I got the letters from Childcareland.com. 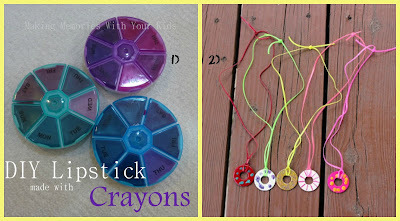 However I found them at Simply Montessori with the link there to download them. She started doing those in patterns. I gave her corn (one of her favorite foods) and some other pictures. The birthday cake came from Dot Marker Printables. 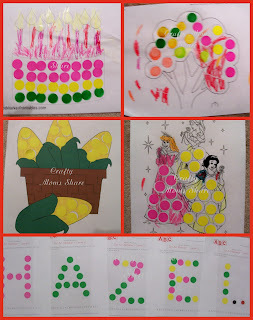 The corn and tree came from DLTK Kids. I also found these wonderful ones of the Disney Princesses on The Activity Mom. Now I gave her dot stickers, her dot markers and then we also punched some paper out. I had intended for us to make our own black dot pictures, but we never did. We did however make an apple tree. 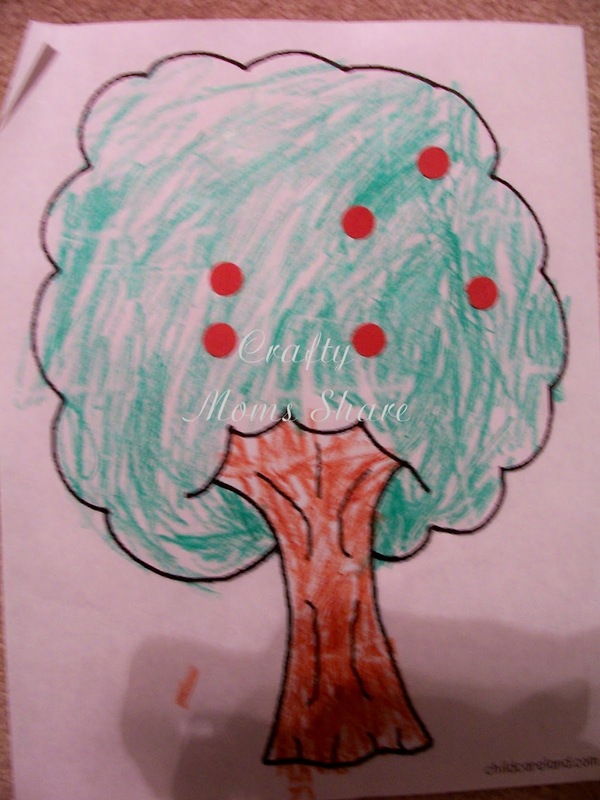 Hazel colored the tree and then glued on the red dots we had punched out. The second week of the story time, the librarian read the story backwards--starting with ten. The project was to make a paper watermelon slice (half a paper plate colored and then a semicircle of construction paper glued on) and count out ten small black beans for the seeds. The Watermelon Counting Game is to be played with a friend. 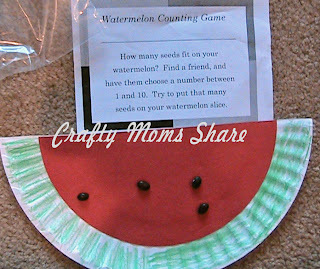 The friend chooses a number between one and ten and you have to put that many seeds on your watermelon. 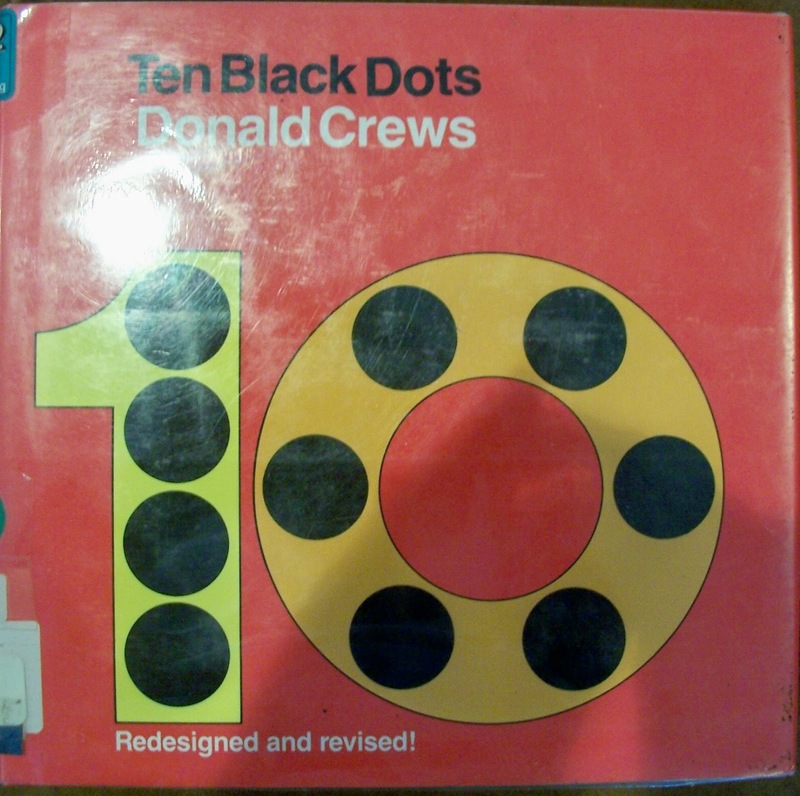 So that is what we did with Ten Black Dots. I know there are many more things you can do. Several of them are here and there are even more if you Google them. Now here is the blog hop. 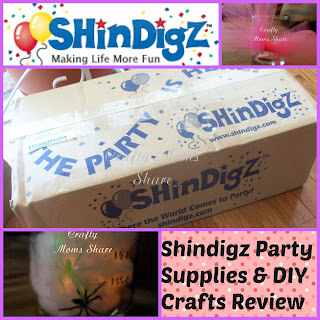 If you have an activity, craft, etc. to go with a Donald Crews book, add it here! Although it has been hard to find different versions of Snow White, I found one called More Beautiful Than the Moon from Algeria. 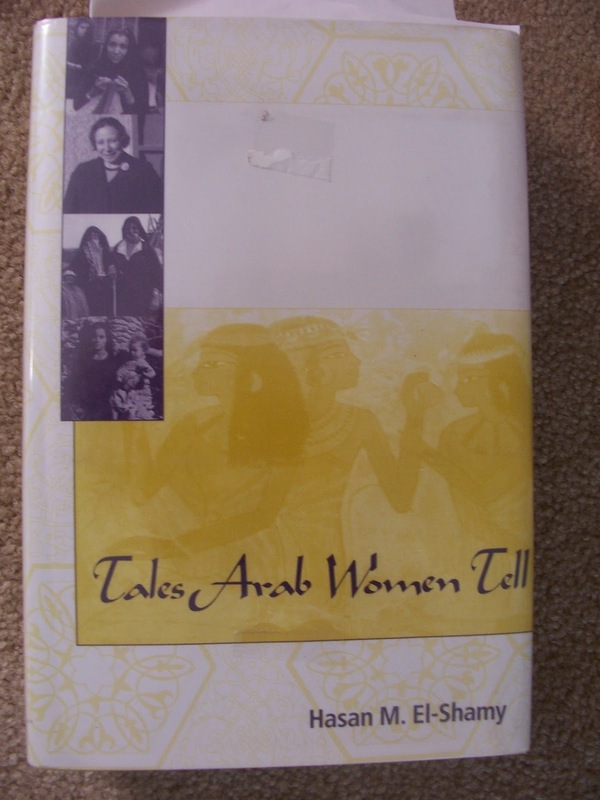 I found an English version of this story in Tales Arab Women Tell by Hasan M. El-Shamy. Now this is more of a resource book than a story book, and this story did not lend itself as well to reading to Hazel. 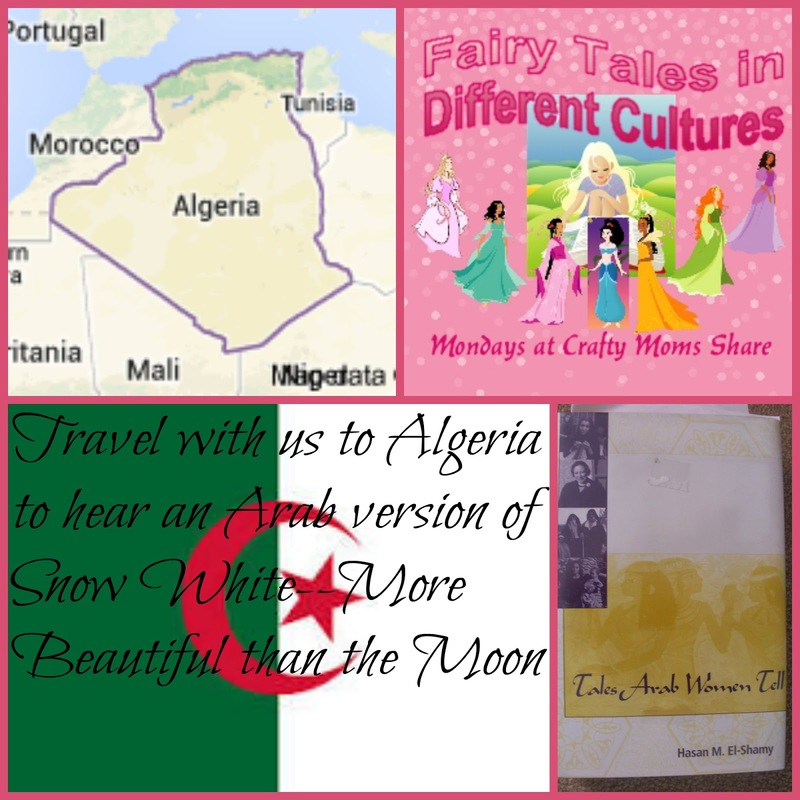 First I will give you a small amount of information on Algeria. Algeria is officially The People's Democratic Republic of Algeria. It is in Northern Africa. It consists of 48 provinces and 1541 communes. It is the 34th most populated country in the world. It is the tenth largest country in the world and the largest in Africa and the Mediterranean. The capital is Algiers which is also the most populated city in Algeria. Algeria has a long history. There were hominid remains found from 200,000 BC. For several centuries Algeria was under Roman rule. In the mid 7th century the Muslim Arabs conquered Algeria and many of the locals converted to the new faith. Algeria also has a history of pirates who attacked Christian and non-Muslim ships. Then the French took over Algeria in 1830. 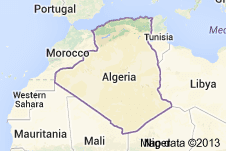 In 1962 Algeria gained its independence. Algeria's economy is dependent on petroleum. They have struggled to find other forms of income. 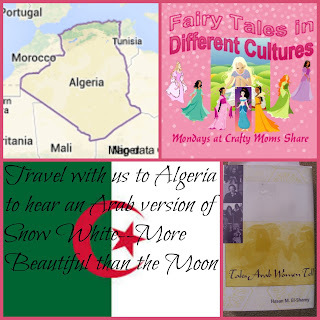 With its long history of various groups ruling it, Algeria has a variety of Ethnic groups. The major one is the Berbers. The Berbers are the indigenous ethnic group of Algeria and are believed to be the ancestral stock on which elements from the Phoenicians, Romans, Byzantines, Arabs, Turks as well as other ethnic groups have contributed to the ethnic makeup of Algeria. Berbers are divided into many groups based upon languages. (Source) Now onto our story. The story is about a beautiful woman who was very vain. She would talk to the moon each night and ask, "Oh, moon is there someone prettier than me?" The moon would answer, "I am pretty but you are prettier than everyone." Then the woman became pregnant and gave birth to a daughter who was named Lalla Ayshah el-Khdrah. The daughter was very beautiful and grew more so every day. The mother went to the top of her house and asked the moon her question. This time the moon answered, "I am pretty and you are pretty, but Lalla Ayshah el-Khdrah is prettier than everyone. The mother was filled with jealousy and asked the moon if she should kill her. The moon told her to wait until she was weaned from breast milk. When this happened, the mother again asked the moon her questions getting the same answer. The moon told her to wait for another milestone and this continued until Lalla Ayshah el-Khdrah knew how to cook, clean and sew and was old enough to get married and have children. The moon then told the mother to kill her or the moon would kill the mother. The mother paid the butcher in jewelry to kill her daughter. The butcher took the jewelry but could not kill the innocent girl. He left her in the woods to let God decide what would happen to her. Then he killed an ewe and filled a flask with its blood for the mother. She drank the blood. Meanwhile, Lalla found a cave to hide in away from all the animals. When the mother asked the moon, it replied, "I am pretty and you are pretty, but no one is prettier than you." The moon answered this way since Lalla was sleeping in the cave--underground. When Lalla woke up, she heard seven ogres eating meat from a carcass of an animal. She remained hiding. One of the ogres said he smelled human blood. They searched but could not find anyone. When they were all asleep, Lalla snuck out for a little food and drink and then went back into her hiding space. When the ogres awoke the brother again said he smelled human blood and noticed some of his food and drink was gone. They searched again, but could not find anyone. Then they yelled that if someone was there, they would not harm the person. When Lalla came out they were stunned by her beauty and said she was their sister. She would cook and clean for them and they would give her whatever her heart desired. She cleaned them up and discovered they became human again. They moved into the forest and she was very dear to them all. In fact they all began to fall in love with her. Meanwhile, her mother asked the moon again her questions. She was in shock to learn Lalla was still alive. She was so angry and jealous the mother dropped dead. The brothers had all fell in love with Lalla and each wanted to marry her. She found a trick to not marry any of them. Then the cat and Lalla got into a fight and the cat put the fire out. She had to go to an ogress house to get a flame. The ogress gave her a flame but also ashes that dropped so she could follow the girl home. While Lalla was sleeping and the brothers were not home, the ogress went in and put seven needles into Lalla's head. The brothers returned thinking she was dead. They put her body on a horse and let it carry her through the forest. A prince was out hunting and found her. He fell in love with her, but the king insisted she must be buried. The undertaker discovered the needles and removed them and Lalla woke up, but was unable to talk. The prince insisted on marrying her. Soon Lalla became pregnant and gave birth to a son. Years passed and the boy grew up and was playing in the garden. Some of his friends teased him about his mother having no relations and he went to his mother and cried about it. For the first time she was able to speak and told her son to tell his father that he wants to see his seven maternal uncles. This happened and Lalla, her son and soldiers and servants went to look for her brothers. She glimpsed the seven walking in sorrow and sent the soldiers to get them. She invited the brothers to dinner. At dinner her son asked her tell him a story and she told him the story of her life. Her brothers realized who she was and embraced her. Then they went to the house of the ogress and killed her. In her house they found seven maidens whom they saved and married. They all lived with the prince and Lalla. Since I did not read the story to Hazel, I did not do any crafts for this one. Sorry! Thank you to everyone who shared with us last week and who visited the wonderful posts shared!! I know I was amazed at all the great ideas. If you missed any of the 50 posts shared, go back and be inspired. 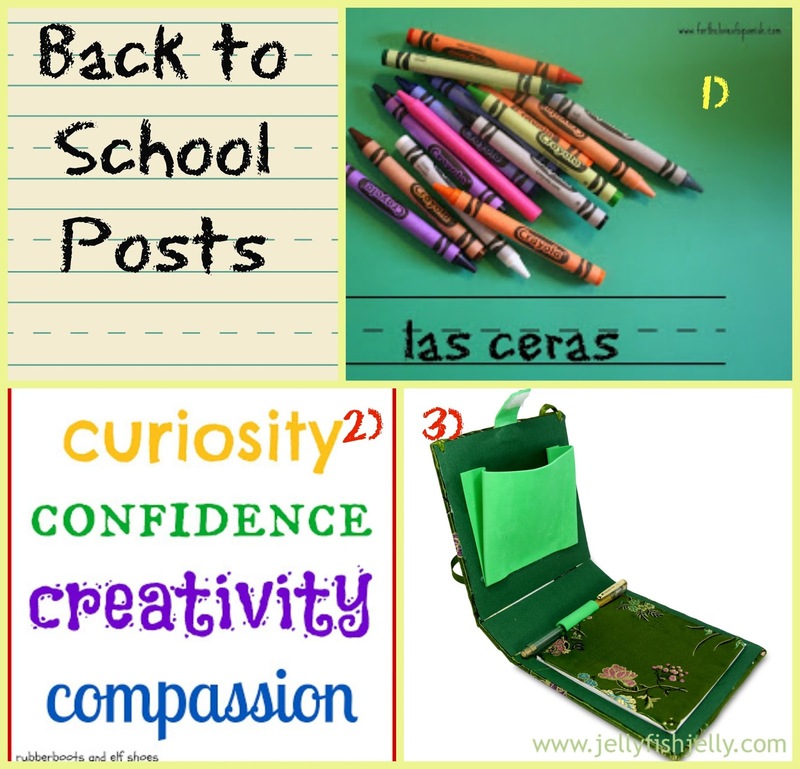 There are still summer inspirations as well as back to school ones and so much more was shared! 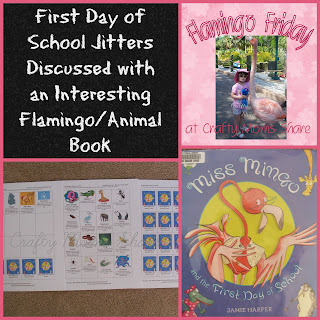 Today we are sharing a book by Jamie Harper, Miss Mingo and the First Day of School. 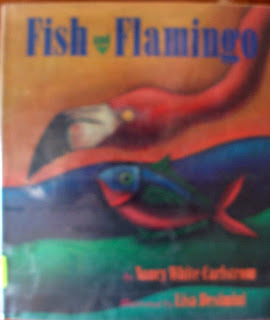 Now the teacher of the class is the only flamingo in the book, however this is a fun book with many interesting animal facts. Miss Mingo's class consists of many animals including an ant to an elephant and a giraffe. Plus she even has a narwhal and an octopus. The theme of the first day of school is to tel what makes you special. 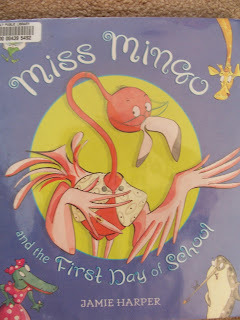 Miss Mingo starts with how she eats upside down and her food makes her pink. Slowly the students begin to share something special about themselves and warm up to each other. The day ends with a pool party in pelican's pouch and using giraffe's tongue as a slide. 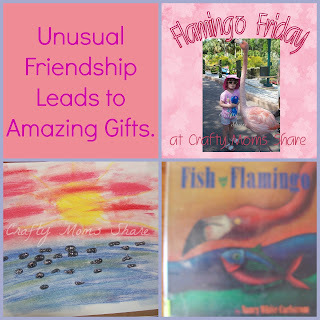 This book is a fun reminder how each of us is special in our own way. I know many students and teachers are anxious about the first day of school each year. I know Hazel is extra anxious since we are switching her school. This book shows how many are shy and that is all right and if you open up and are yourself you will have fun. To go with this book, I made up a little memory game. Hazel and I had fun playing it. 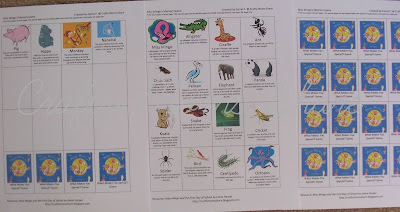 The cards have each animal on them with their special characteristic in small print. To download your own copy in Word, click the picture below. I know many schools have started or are starting next week. Hazel's new school does not start until after Labor Day, so we still are enjoying another week of summer. The change of schools has caused quite a bit of anxiety in Hazel, but we know it is the right thing for all of us. She has been very clingy this summer because she is afraid of the unknown. Now I know I have not shared much as to why we have made the decision to switch schools. We had a bit of a discipline/communication issue last year. There was one student who had a few impulse issues and Hazel had a few run-ins with him. One being something inappropriate said to her. I found out about it from another child or that Hazel had cried quite a bit that day and it took me two hours to find out why from her. Then towards the end of the year she told me that the same boy was going under the snack table and biting her legs and pinching her. The teacher's response was that she thought it was only pinching but biting was unacceptable. Now pinching was unacceptable to me and the fact that it was happening quite often and I had not been told anything by anyone. Now many of the students had issues with this boy (one refused to come to school anymore even after he was kicked out). But what bothered us most was how it was dealt with and that we heard stories that it was not the only time where they had these kind of issues. We decided then that this was not the place for our innocent, shy, rule following (to a fault) daughter and looked for something else. We went to the opposite type of school and now she is going to be attending a traditional Christian school. She is excited that she will learn to read this year, but scared to be leaving what she has known. 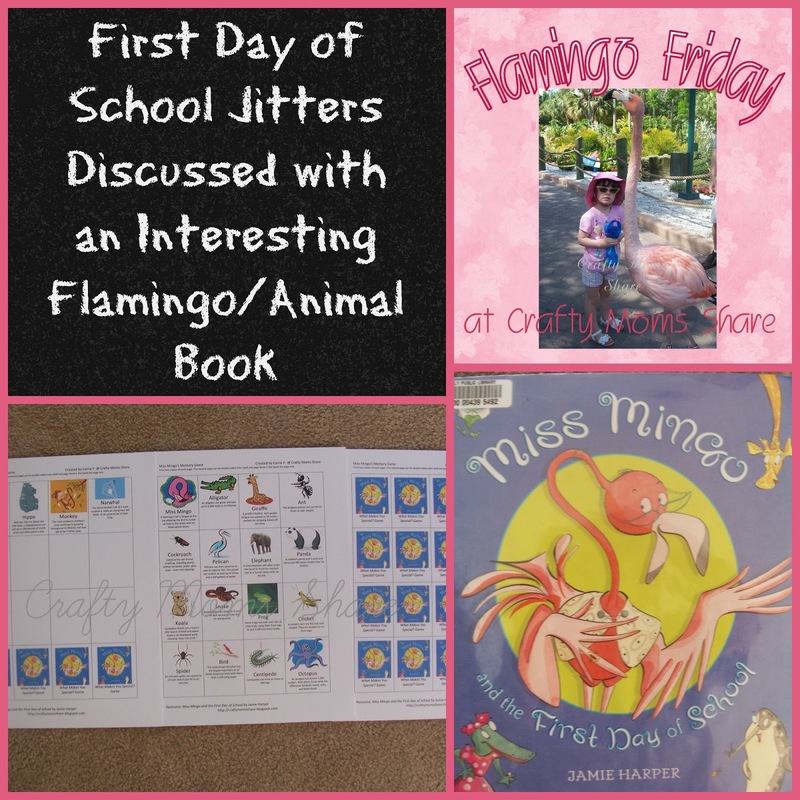 To ease this transition, we have read books about the first day of school, we have had playdates with a few of the students in the new school and we have had several visits to the school. Today she got to spend some time talking to one of the teachers when we stopped by for a visit. I think this helped. There are several blogs that have wonderful lists of books to read, so I am going to leave a few links for you in case you want to ease the day as well. So that is our story on going back to school. We have truly found Miss Mingo and the First Day of School enjoyable to read and educational. Plus it has enabled me to have many conversations about the first day of school and making new friends. 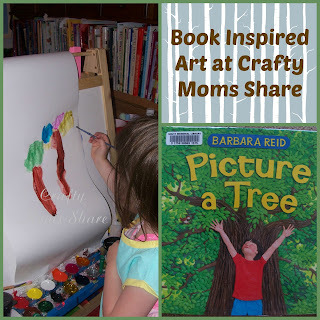 Today we are sharing a wonderful book, Picture a Tree, by Barbara Reid. 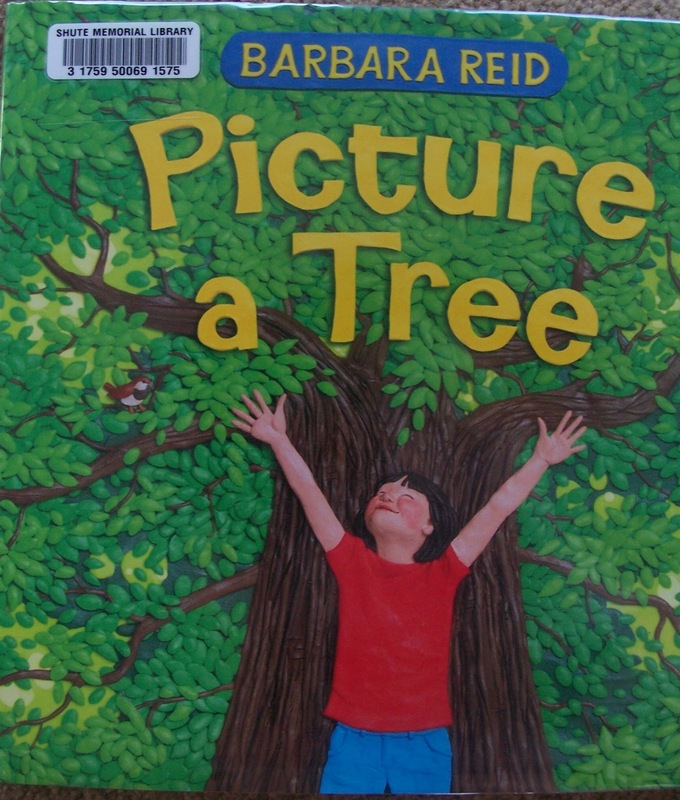 This book is a fun book that looks at the different ways to picture a tree for example trees look differently in the four seasons. Through its wonderful story and picture it compares spring trees to paint or art class and it compares trees to other things like a tunnel, an ocean and more. It also looks at how trees can be used as homes and as toys (for example pirate ship, or clubhouse). 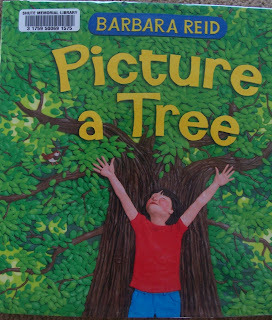 It is a fun book to get you noticing and thinking about trees and nature more. How do you picture a tree? We decided to paint some trees. Here is how Hazel was picturing trees this day. 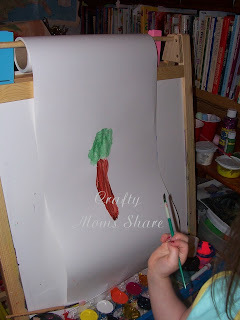 Hazel's first tree was pretty basic, but I was happy to see how her painting could actually look like something and not just a mess of colors. After this tree I asked her what trees look like in the fall. She added a tree to the painting. She however decided to make it with unusual colors for the leaves. 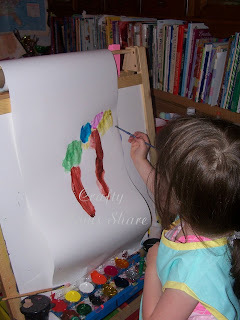 As you can see she had fall color paints, but used blue, pink, yellow and silver. At least I know she is creative. After painting two trees she wanted to paint her old way--just colors everywhere, but she was practicing mixing colors. So that is our simple way to think about trees. How do you picture a tree? September is National Hunger Action Month. This year I thought I would get a head start. 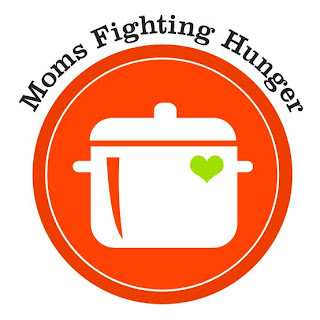 I am joining the amazing group of bloggers again called Moms Fighting Hunger. 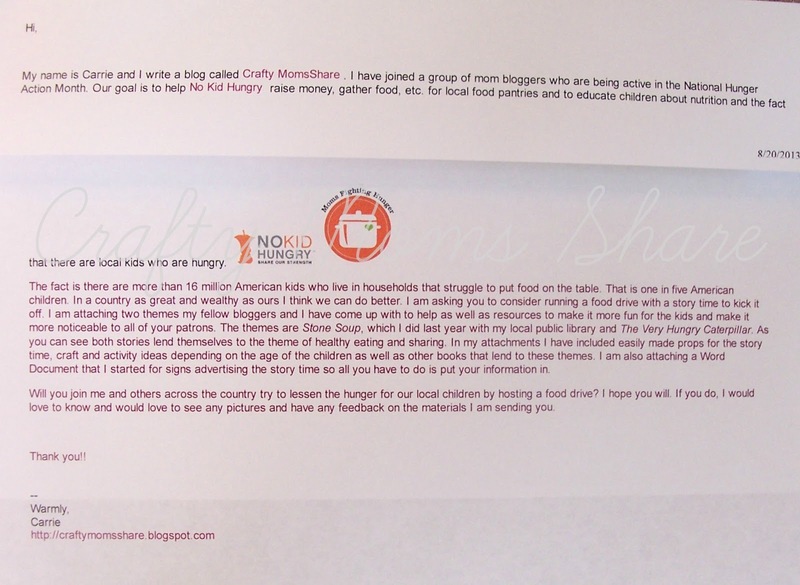 We are joining with No Kid Hungry to try to help combat childhood hunger in our local areas. Last year I challenged you my readers to join me in gathering food for local food pantries. Again I will extend this invitation to you. Last year I also helped plan a story time food drive at my local library, but since I got started late, it was in October. We used the theme of Stone Soup for it. This year I am starting earlier. I passed on Jen's from The Good Long Road idea of a food drive themed around The Very Hungry Caterpillar back in the spring, and we discussed doing a story time theme, but it hasn't happened. We are now thinking of doing some combination with the library's food drive around Thanksgiving. I also did a generic flyer to advertise the story time with spots to fill in each places information (in red). The flyer is in Word, so it would be easy to change. Here is The Very Hungry Caterpillar. A big thank you to Vickie from Mrs. Plant's Press and Chelsey from Buggy and Buddy for allowing me to use their pictures on my outline. For Stone Soup, I used pictures from our story time last year on the outline and including a tutorial on making the story stones we used. Then I made a generic flyer again for this story time theme. Finally I made a set of memory cards to go with Stone Soup. The ones I printed, I forgot to center the page so you could print double, but I have fixed it in the printable. I figured it would be a fun activity and also an easy take-home activity. 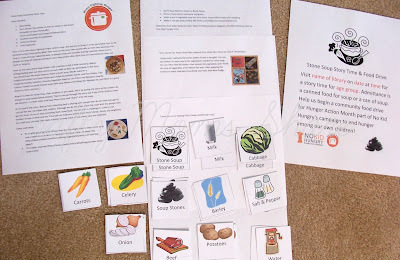 I have not found as much on Stone Soup as I did The Very Hungry Caterpillar, so I wanted to add some more to it. I then sent these as attachments to the local libraries and preschools. Above is the e-mail I sent out. I am sharing all of these in hopes that others will want to use them. Either to send out to local libraries in your area or to plan your own story time food drive. 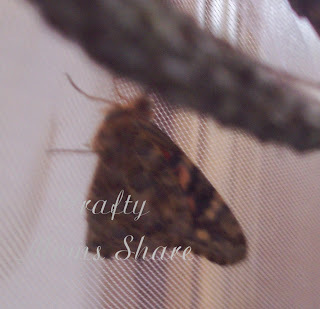 The next thing we are doing for Hunger Action Month includes our long talked about butterfly party. Hazel made up a Butterfly party song she sang at the library yesterday while playing her ukulele. Sorry I couldn't figure out how to turn the picture with the software it was in. We sent out our invitation to the party asking people to bring fruit for a fruit salad and a can of fruit or vegetable for the local food pantry. I included the video in the invitation and somehow my clip art did not show up. Oh, well. Hazel is so excited for it. I will post more as we get towards it. So that is what we are doing for Hunger Action Month. 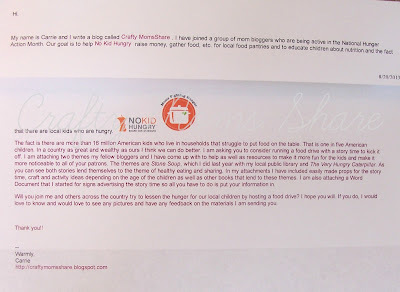 Will you join us and get the word out to help our hungry children? After all, one in five American children are from a family who struggles to get enough food on the table. In a country as great as the United States, I think we can do better for our children.